We accomplished a lot this year at Wide Open Vistas! Two board members (Kathleen and myself) walked, climbed, and crawled 1,200+ miles across the Himalaya while fundraising for WOV (short video). 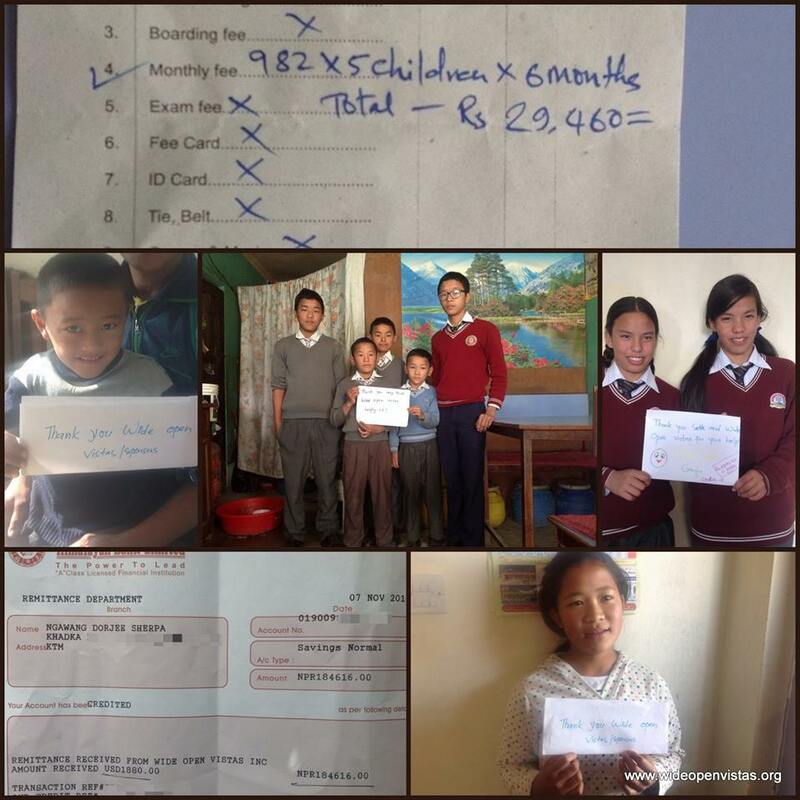 After finishing, we put donations to work helping children attend school in Kathmandu. Other accomplishments include setting up a fund for micro-research grants in health sciences, a new website, and we were approved as a 501(c)(3) tax exempt organization. To be honest, some of these things took a lot longer then they should have, and we still have a ways to go, but we don’t think it is too shabby for a volunteer driven organization. The most tangible accomplishment is helping nine children with their school costs for the next year. Five of the children are boys, their father Pasang Sherpa a porter from the Solukhumbu region of Nepal (funds raised in 2012 also went to Pasang’s children). His wife has a little dumpling shop in Kathmandu; but they barely make ends meet and it is a struggle to send their five kids to school. We are also helping to support Kelsang and Ganga who are 15 years old twins. They are living with Dorjee’s brother near Boudhanilkantha. And we are helping the son of another porter Sarki Sherpa as well as Maiti, a twelve year old girl who lost both parents two years ago. Funds are paid directly to the schools and we keep a paper trail of everything. On a related note, we managed to recruit Dr. Tania Gavadia to the board; I crossed paths with Tania in the Annapurna region in 2011 and drafted her to give an impromptu lecture to the undergraduate health science students I had in tow. We’ve kept in touch since and I’m happy to say Tania just finished her PhD in public health and that her dissertation work looked at maternal/child health outcomes in squatter communities in Kathmandu. Moving forward, Tania will be really valuable in helping us select and implement evidence based interventions. For more design help and especially measurement and evaluation, we are lucky to have Kathleen Egan who holds a MPH from Emory in epidemiology. Kathleen and her husband John Fiddler both raised funds for WOV while walking across Nepal. Speaking of which, another accomplishment was keeping Dr. John Fiddler off the board. Although he has a certain amount of cachet as a former intern on the reality tv show ‘Animal Planet, Emergency Vets’, and being voted ‘Seattle’s Best Emergency Vet’ is pretty cool. And yes, he did walk across Nepal in support of WOV; but his ideas are simply not sustainable. To wit, funding a fleet of helicopters to simultaneously air-drop handkerchiefs on every child in Nepal. Whether there would be one entirely snot free day across the country is debatable. We are not funding that. Sorry John. But keep the ideas coming. Dr. Fiddler lecturing children on the trail about Obama and staying in school (they didn’t understand a word). Thanks to Courtney Kopec CPA who has donated his time and financial expertise, guiding us through the 501(c)(3) process which became quite the endurance feat. For those of you who donated in 2014, we will be sending (in mid-January) out statements to use with your tax returns. Which brings me to a huge thanks to everyone who has donated past and present. Your funds go a long way in Nepal and every dollar counts. We are volunteer run and deliver funds directly to the schools – making sure we get receipts with children’s names. A big thanks to board member Dorjee Sherpa who makes this happen. In addition to these nine children, we have over $942 in our education fund – we will be putting this to work in the Spring of 2015 once we have the new education plan in place. And we are helping increase the health research capacity in Nepal. With a research fund with almost one thousand dollars in it (92,308 Rupees to be precise), we are working with professors at Kathmandu Medical University in Dhulikhel to distribute these funds as mini-research awards to students in allied health science. It’s your donations that are making this possible. Our only expense to date has been credit card transaction fees and $45 to wire funds over. We still need your help. Nepal is one of the top ten poorest countries in the world. Even $10 month can help a child attend school. Living in Seattle, that is less then two coffees at Starbucks. Please consider a re-occurring donation of $10 per month. We are also very interested in people who are accomplishing big goals. Whether it is your first marathon or hiking the pacific crest trail…think about using your personal adventure in helping others. The future looks bright. 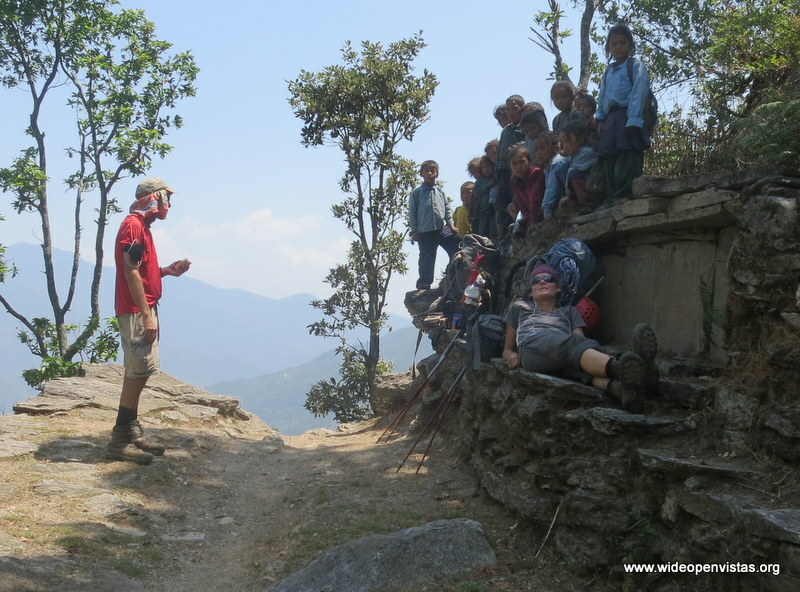 Thanks everyone for your support in getting Wide Open Vistas established as a charitable organization and for making it possible to help in Nepal. If you ever have any questions, please don’t hesitate to contact me or any members of the board. Have a happy and safe new year. -Seth, PHD MPH RN – co-founder and president.